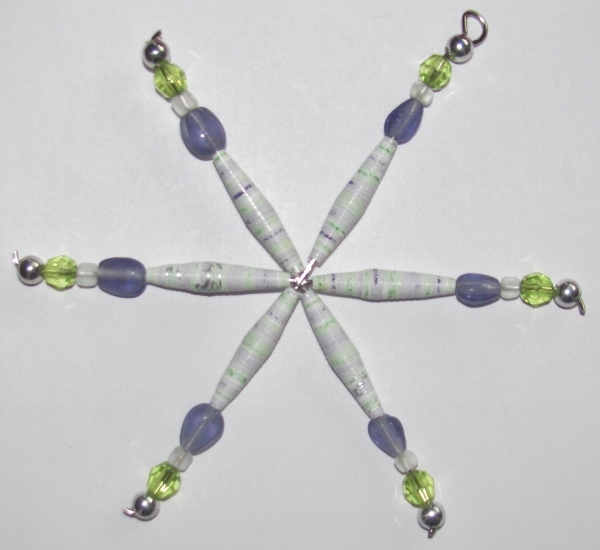 When I was at the closeout sale at the bead store I picked up some parts to use on making evenly spaced triple bead strands. 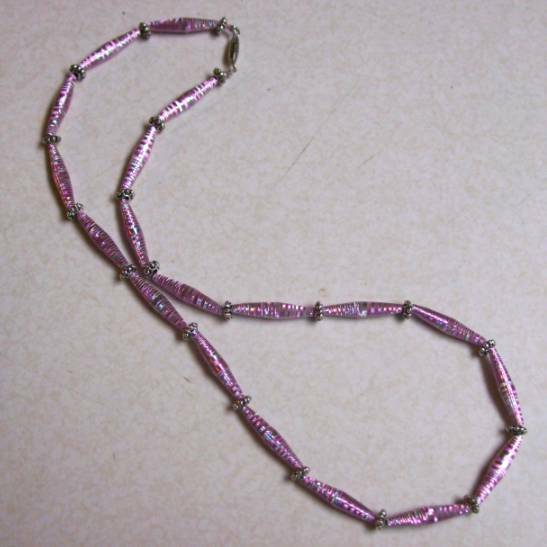 These included silver pieces that transition from three loops to one loop and silver bars with three holes. 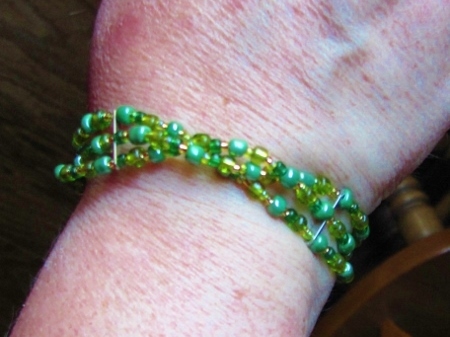 I dug through my bead stash and selected tiny gold beads, tiny light green beads, medium grass-green beads, medium-large olive beads and medium-large turquoise beads. All were translucent except the turquoise. 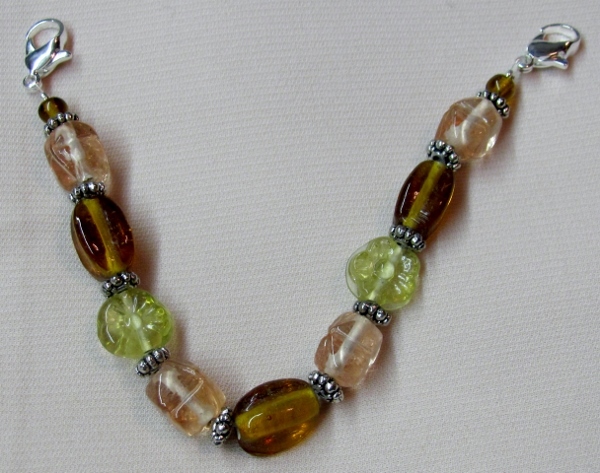 I used beading wire to string three strands of the beads working randomly on the color mix. I attached the three strands of wire to one of the triple-loop terminators. 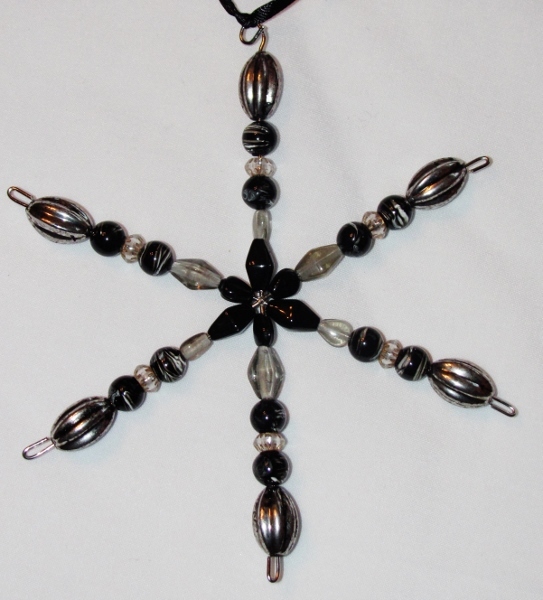 Then I strung 2 inches of beads on each of the wires, twisted them around one another and threaded them through the holes of the spacer bar to keep them twisted. Another two inches on each, twisted, threaded through a spacer, two final inches, twisted and then attached each to a loop on the other terminator. 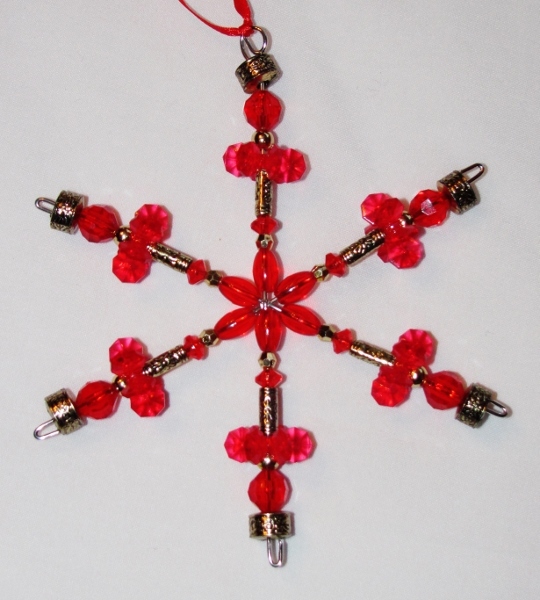 I used crimp beads to attach the wires to the loops, threaded the extra length of wire through several beads and clipped it. 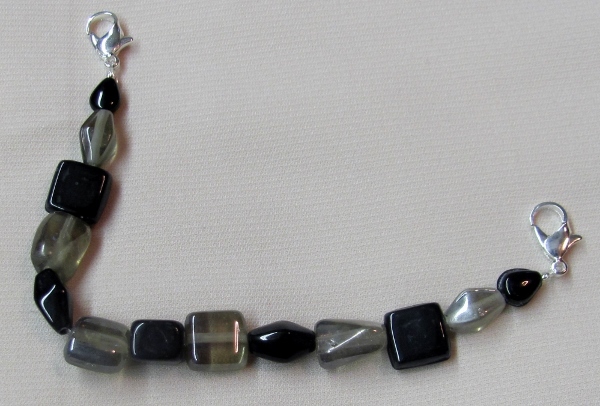 Here is the finished bracelet and you can see the spacer bars holding the twists in place. Here you can see the terminators to which I added jump rings. 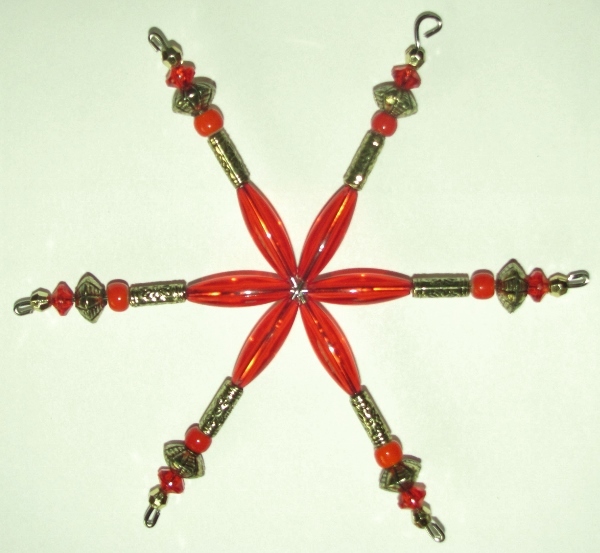 One got a lobster claw clasp. Now that's something different for me. I have now used up all my bargain purchases. When I got an email that a local bead store was having a BIG sale pending closing the store at the end of August, I went in mid-month to have a look-see. The owner asked if she could help me find anything and I explained that I really wanted to learn how to do beading beyond just stringing strands. She politely told me I should have come in before because she USED TO do classes several times a month. Then she sat down, picked up her cell phone, and proceed to play Candy Crush. Thank you SO much for your service! I wandered around and picked up a few things that interested me anyway and got the 50% discount. I didn't learn anything new and ended up doing exactly what I had been doing all along... stringing strands. I did, however, make two nested strands to switch things up a bit. 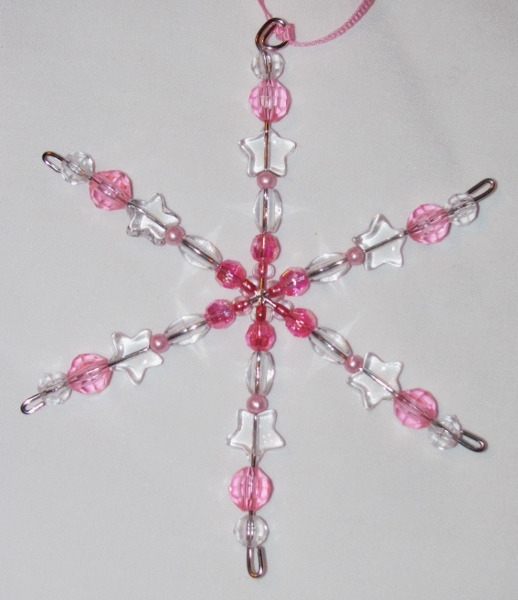 The beads I bought were the irridescent stars, the Irridescent drops and the clear blocks. From my own stash I pulled polished garnet chips. Way up at the top where you can't see them are 3/4" gold tubes and a magnetic closure. The other thing I did new on this piece was use beading thread with knotted ends instead of stretchy cord or beading wire with crimp beads. 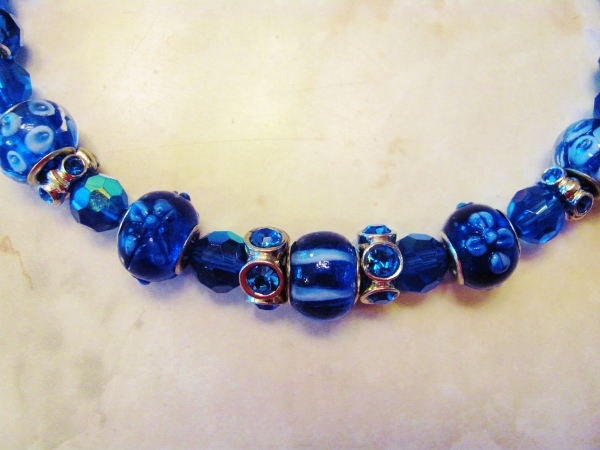 Some months back I was given a little jar and little package of bright blue beads - imagine the giver's surprise when she gets them back as a birthday gift! 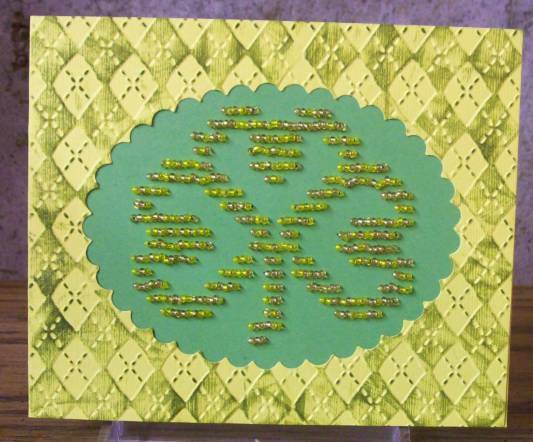 My first step was to arrange the large beads in a balanced layout on my bead board. Then I had to decide how best to string them because some were large hole (like Pandora) and some small hole (standard beads). 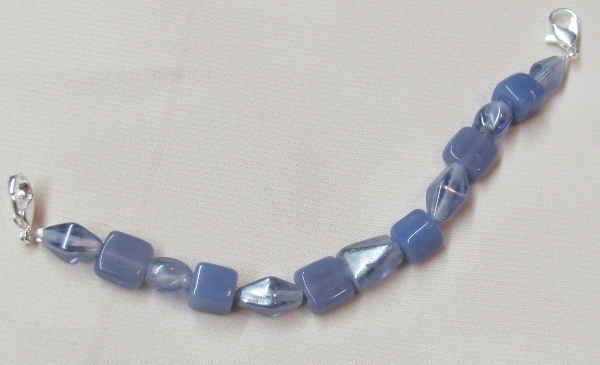 In looking through my own bead stash I found a bag of small faceted beads in the same blue and they fit through the holes of the large beads perfectly! 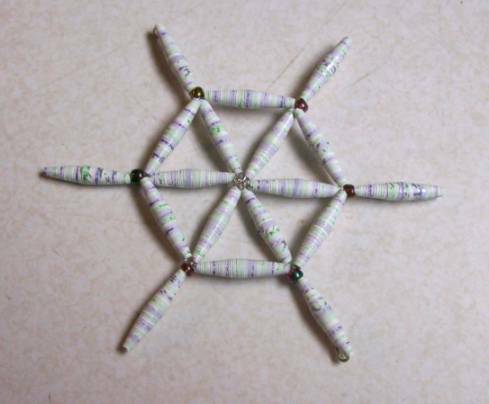 So I used beading wire to string a leader and ender of the small beads and then alternated the large hole beads with the small hole ones using the small faceted beads for the large hole beads to ''ride over". 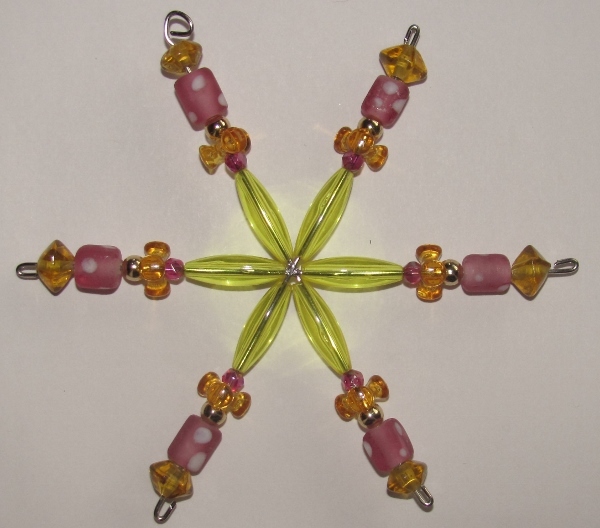 Depending on the size of the bead it might take from one to three beads to fill the center. 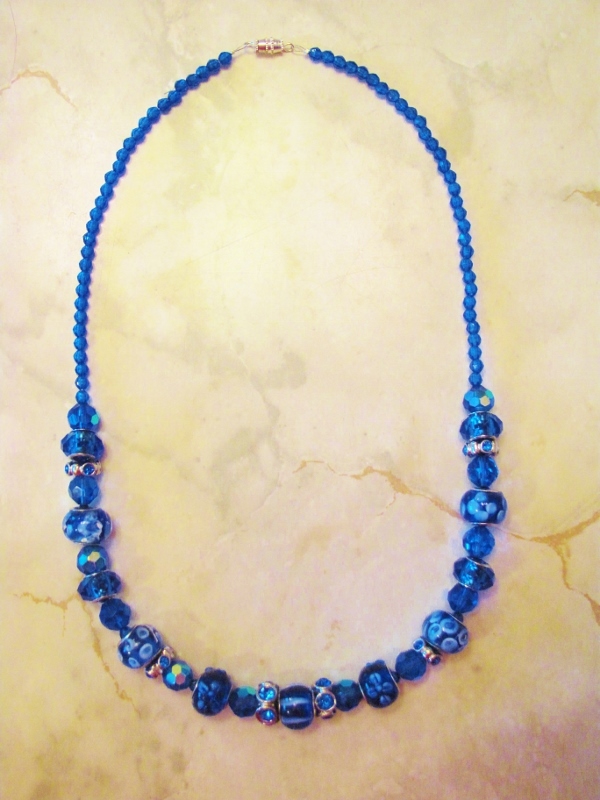 You can see the beads have silver hardware on them and the large faceted beads have a aurora finish. I used a screw-type closure at the back. 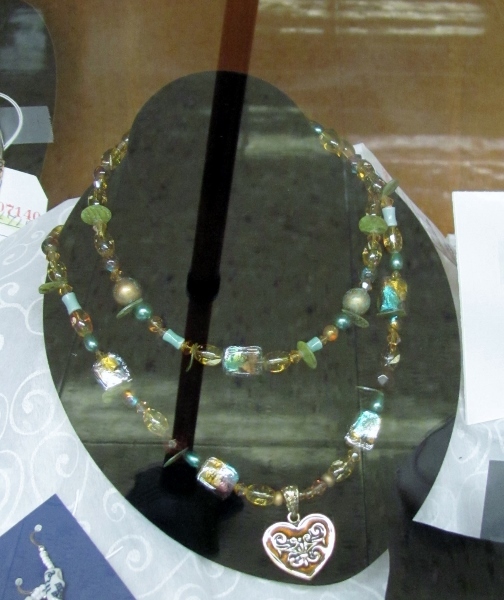 I entered only one thing in the Beading and Jewelry class at the County Fair. 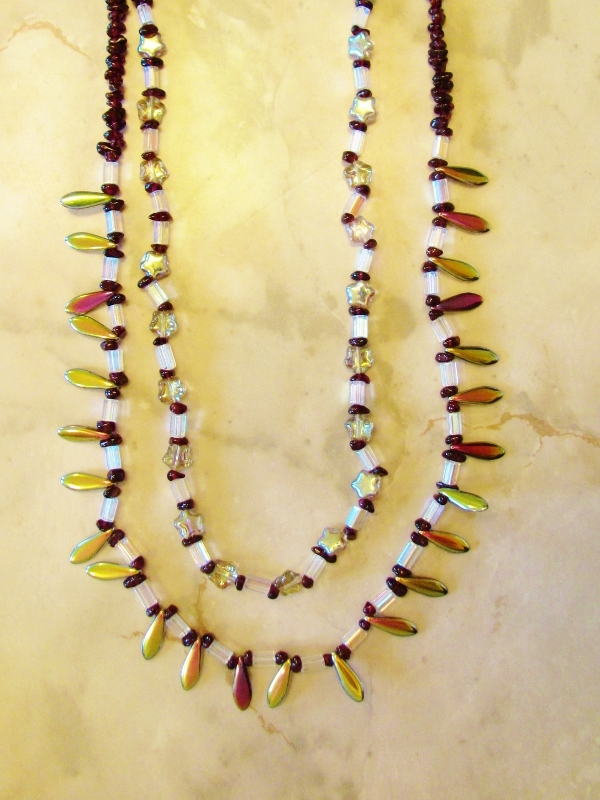 Unfortunately, this beaded double-string necklace did not win an award of any kind. I always gets lots of compliments when the owner is wearing it and that makes me happier than an award! 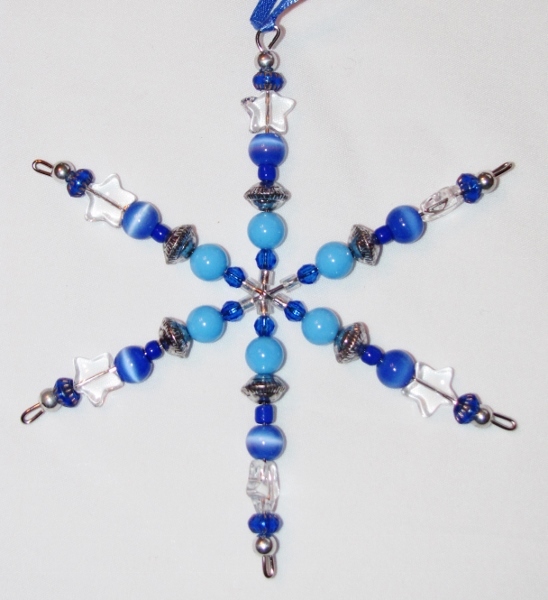 I had so much fun making those beaded snowflake ornaments (except when I poked my thumb with the wire) that I decided to do more and use them on packages for Christmas. 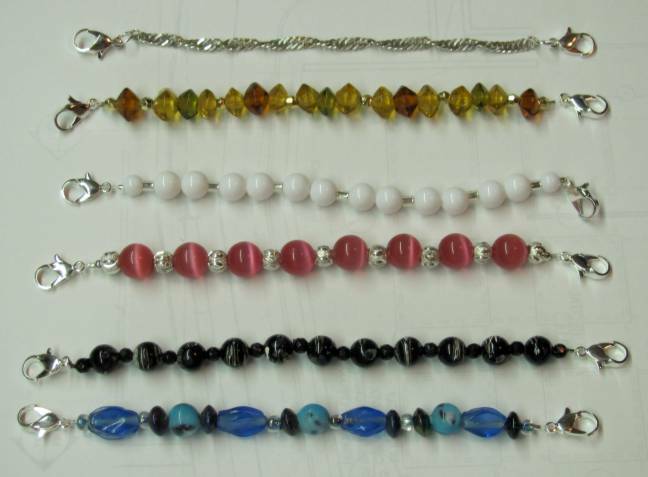 I still had the bead bins all over my work surface so it was easy to come up with sets of beads to use. Other than pinching my palm with the pliers, this session was injury-free. I may need to get a new set of wirecutters for jewelry since this wire is SO hard it nicks the edge. I still have about 10 of these wire frames to use next year. Hmmm, maybe for a necklace? U 1 2 C M ? 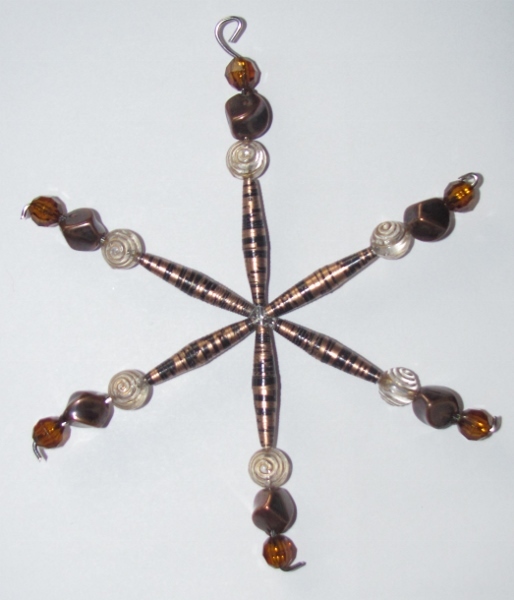 Many moons ago I bought some wire snowflake frames to use in a workshop. Plans changed and I put them away for personal use and never got around to doing anything with them. I got out the bead stash and sorted the little bags into color groups. Then I gathered several bags together that I wanted to combine and started stringing them on the wire frames, one spoke at a time. On five spokes the wire gets bent about 1/4 inch from the last bead. 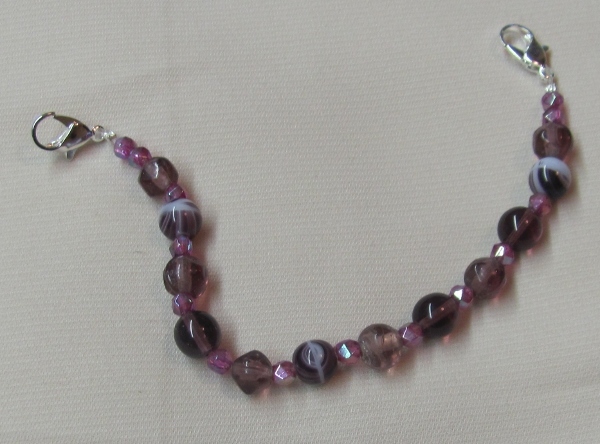 The wire is then clipped and turned back into the last bead. On the last spoke the wire gets a right angle turn right at the bead. Then the wire is clipped at about 1/2 inch and curled up with round nose pliers to make a loop for hanging. The worst thing about working with these is the hardness of the wire. They are not likely to ever get bent out of shape because it takes a lot of muscle to bend and to clip the wires. You definitely have to have the right tools for these - and I hope I am not ruining my good jewelry tools on them. 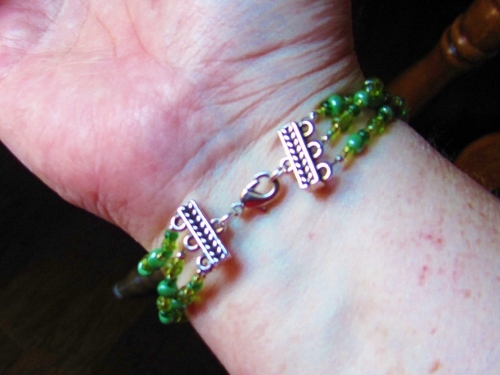 While I had the jewelry findings out on my work table I grabbed the bins of beads and put together more stretchy bands to attach to a medical bracelet. Some are similar to ones I have made before (working from the same stash) but will go to different wearers so it is not a problem. 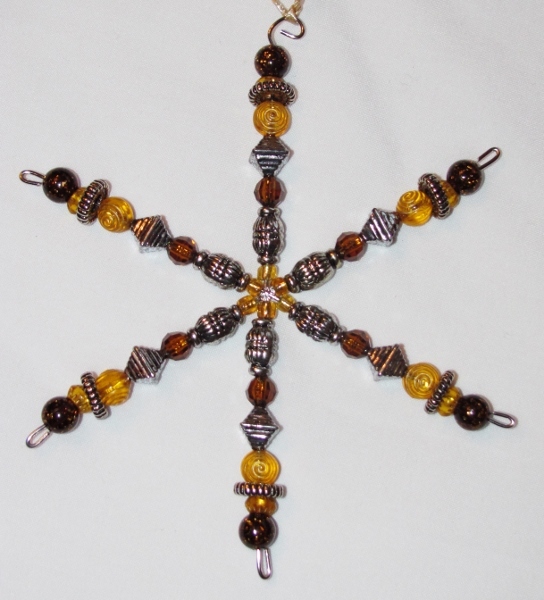 I made 10 of them and they are all 5.5 inches in the beaded part. 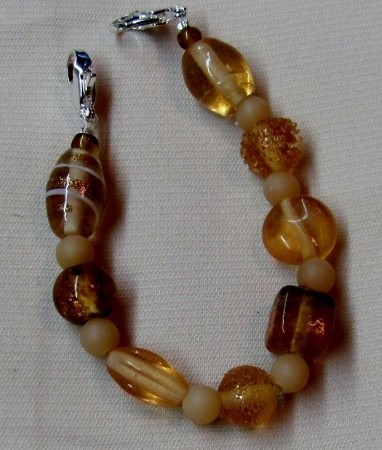 Because of cropping some of the beads appear here larger or smaller than actual size. A whole wardrobe of beaded bliss. I put together another set of stretchy bands for medical ID bracelets. You can see on the right how they clip onto the metal information plate by using the lobster claw clasps on each end. 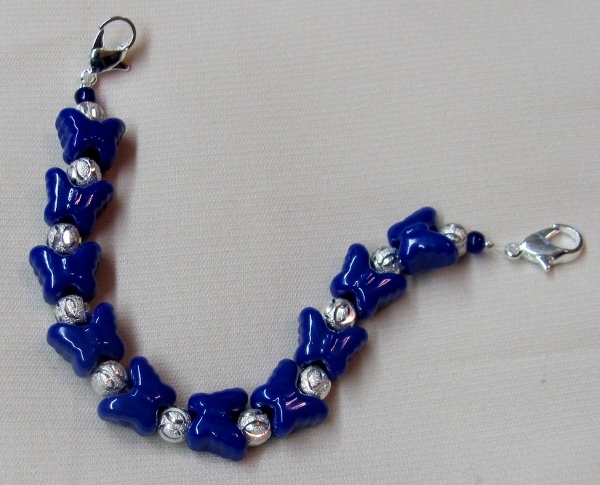 This one as well as the blue ovals are polished stones that I bought for this project. 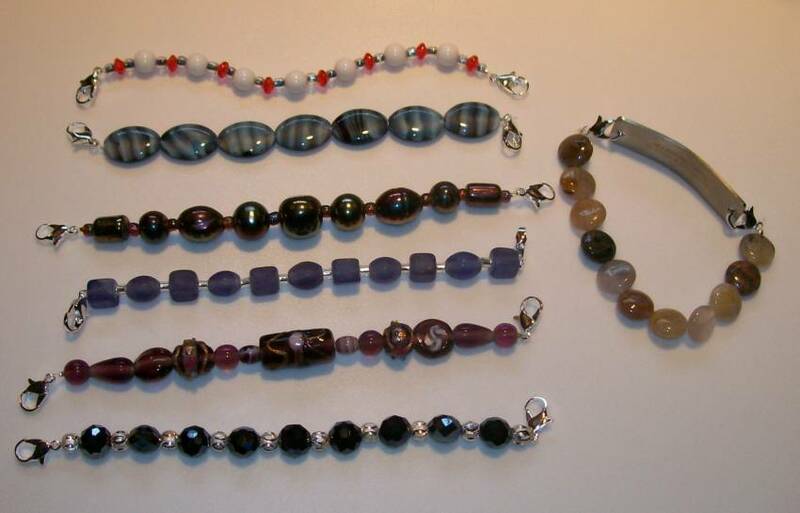 The rest are put together from a mix of beads in my stash. These are so easy to put together that you can have a whole wardrobe in no time at all. 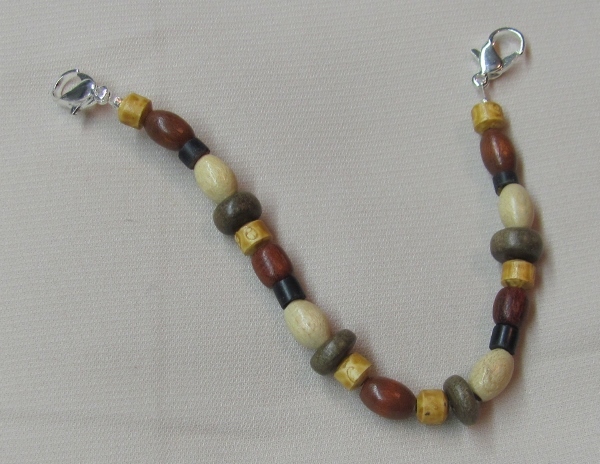 In fact, the most time-consuming part is deciding what beads to use! Oooo, aaaaah! The lady who requested these was very pleased with the result. She had purchased one and wanted more to go with her wardrobe. Yes, one is still chain but it has a twist in it and is much nicer quality than the one that comes standard on the bracelet. I had a leftover card with the cross-stitch pricked out and decided to bead it. 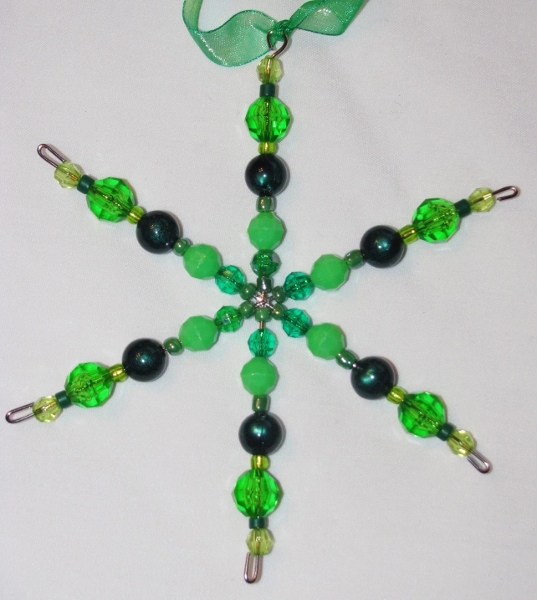 I used yellow beads but they pick up the color of the green panel and it darkens them. I folded a side-fold card front in yellow and used a scalloped Nestability die to cut an aperture. Then I ran it through the Cuttlebug with the 'argyle' folder and then used a 'lettuce' Adriondack ink pad direct-to-paper to color the raised portions. I attached the beaded panel to the inside of the cut-out. 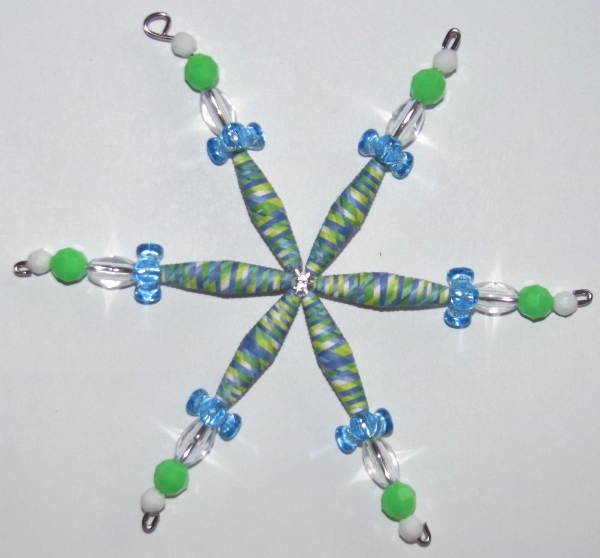 I made a wire frame and used paper beads to create this snowflake ornament. This was a design I created in my sleep last week! Worked just as I dreamed it. 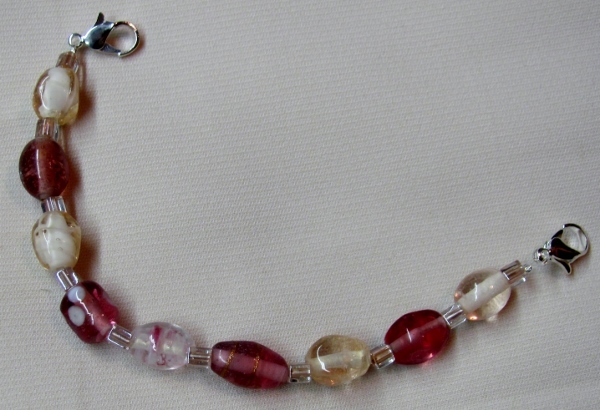 Another paper bead necklace using silver spacers. The beads are made of gift wrap again. 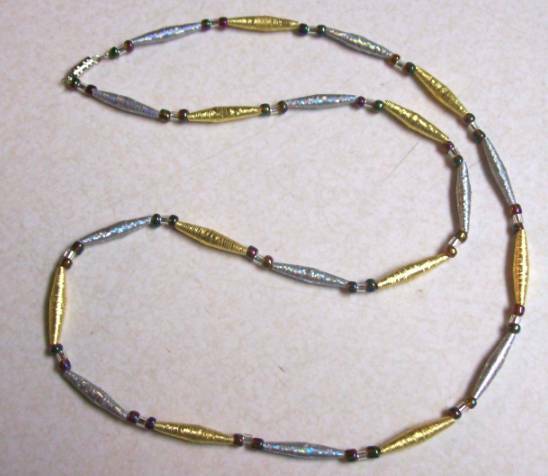 I used a gold and a silver wrapping paper to make paper beads then strung them with two different glass beads to make a long necklace. 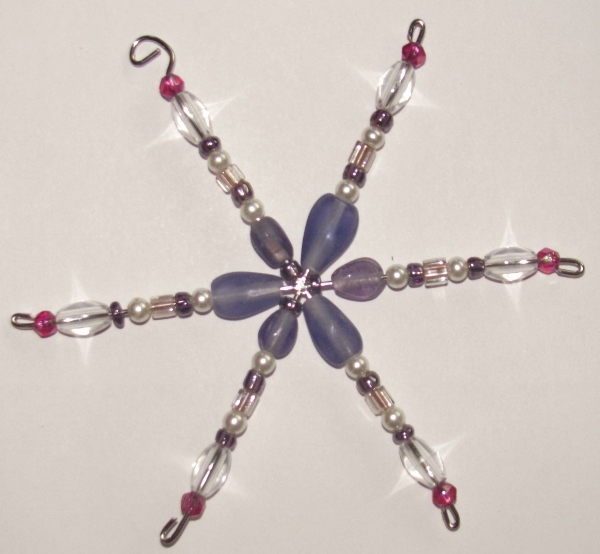 I had not used beading wire before so the construction was a new process for me.